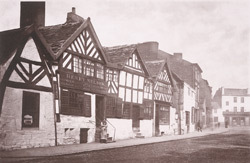 View representing "a quaint old black-and-white gabled building in Greengate, which from the peculiar disposition of the main timbers in one portion must be of very early date. For many years past the house has been occupied as a tavern - the 'Bull's Head,'...The open space in front of the 'Bull's Head' was formerly occupied by the Court House, the Stocks, and the Cross; and it was here that Wesley (1703-1791, founder of the Methodist movement) preached on the occasion of one of his visits to Salford." Text by James Croston from his book 'Manchester As It Is'.